The official volunteer-driven blog of the Forget Me Not Shelter. Miso is a funny, happy, very laid-back 6 year old girl, who arrived at the shelter with her kittens (our current “C” litter) when their owner decided they just had too many cats to care for. 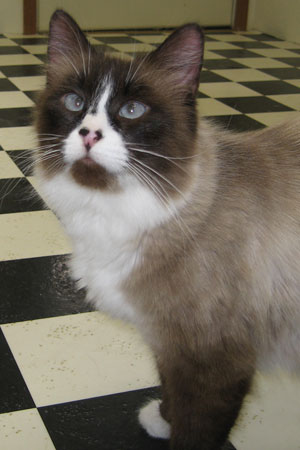 She is definitely part Siamese, with medium length fur, a pretty and unusual coat, and adorably goofy crossed eyes. Miso will be a very easy-care cat; she is affectionate, but not demanding, and prefers relaxing in a sunspot to… well, just about anything! She would do fine as an indoor or indoor-outdoor cat, and would be a terrific “starter pet” for a first-time pet owner, or an apartment pet. While she seems to be tolerant of other cats, she doesn’t much care if she has a cat buddy or not, so would do fine as an only pet. See her full listing for more photos, video, and application. This might be a little late, but Miso is not part Siamese, but a normal American cat, her color and markings are called Snowshoe. Crossed eyes is very commonly associated with snowshoes, and they are great cats. The cat in their photo sure does look a lot like Miso, but with shorter fur. Thanks for the fun research project of the day! Hope we get another Snowshoe mix in one day. Except where noted otherwise, all content on this blog copyright © Forget-Me-Not Animal Shelter of Ferry County, available under the terms of the Creative Commons Attribution-NonCommercial-ShareAlike 3.0 Unported license with attribution to Forget Me Not Shelter and a link back to the original page. Opinions expressed in this blog may not reflect the opinions of the Forget-Me-Not Animal Shelter of Ferry County or its Board of Directors.